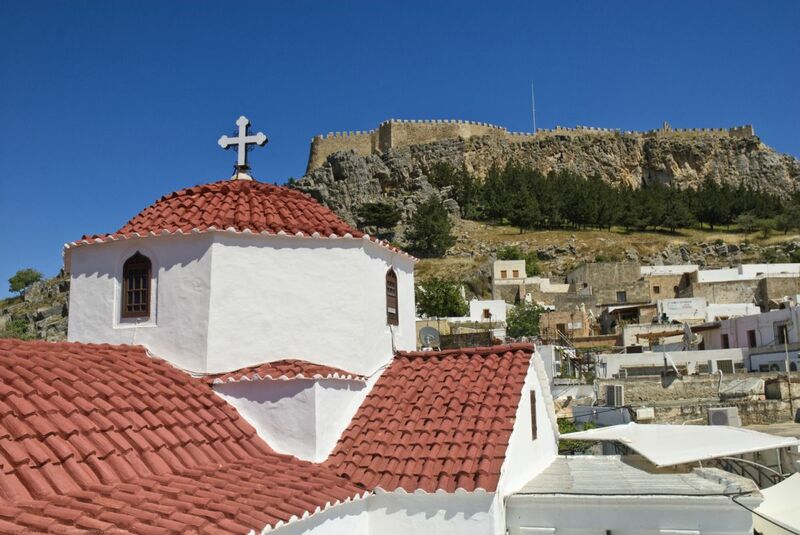 In medieval times Lindos was a most important settlement on the island, second only to the city of Rhodes. It was then that the ancient Citadel (Acropolis) was fortified into a castle. 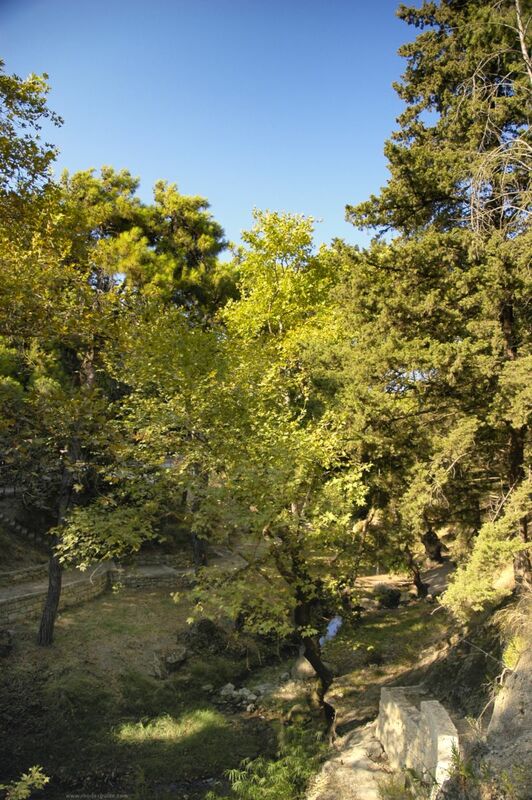 Tradition has it that St. Paul the Apostle landed here when he came to the island of Rhodes, which explains why the tiny cove on the other side of the settlement was named "Aghios Pavlos" (St.-Paul's cove) . At the foot of the steep cliff of the Citadel lies the township, charming the visitor with its whitewashed houses and pebbled courtyards. Houses retain traditional interiors, heavy ironwork on balconies and brown windowpanes. Some 15th-century mansions have been officially listed as part of the Hellenic cultural heritage, thus put under a special protection regime. Also not to be missed: The Greek Orthodox church of Our-Lady-of Lindos (Panagia) and the chapel of St. Paul (Agios Pavlos). A series of steps lead to the Citadel. Past the main gate one comes across the ruins of the Knights' Lodge and the byzantine church of St. John. Outside the Doric Arcade (Stoa) the prow of a Lindian Hellenistic trireme has been carved in a rock (4.5m x 5m). Going down the Doric Arcade (5th century BC) with its 42 pillars (20 of which have been restored) the visitor is invited to climb the majestic staircase leading to an elevated terrace, featuring the remains of a Propylaeic complex (5th century BC). From this point on, one reaches Sanctuary of Lindian Athena, with its elegant bi-prostyle temple on the edge of the cliff (4th century). The remains of an ancient theatre have been unearthed on the slope of the Acropolis. 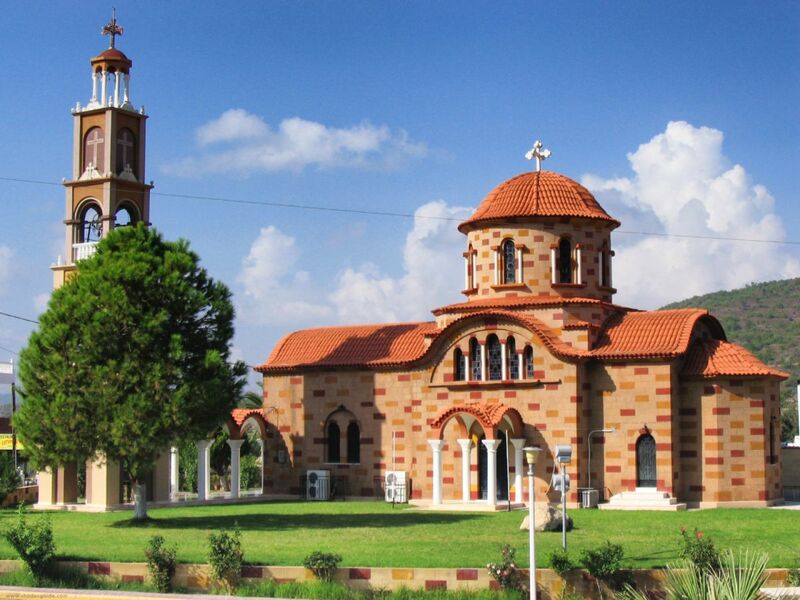 There are other attractions on this part of the island besides antiquities. Koskinou (10 km) is an inland village with charming traditional houses. Kalithea (10.5 km.) is built around a colourful pine-grown bay, boasting of the presence of an old, recently renovated spa; Faliraki (14 km) is a cosmopolitan resort featuring an exquisite beach; Ladiko, an inviting cove ideal for swimming and idling for ever, Afandou (21 km), a typical Rhodian village with an interesting church and a golf course, to name only a few of the numberless points of interest in this area. 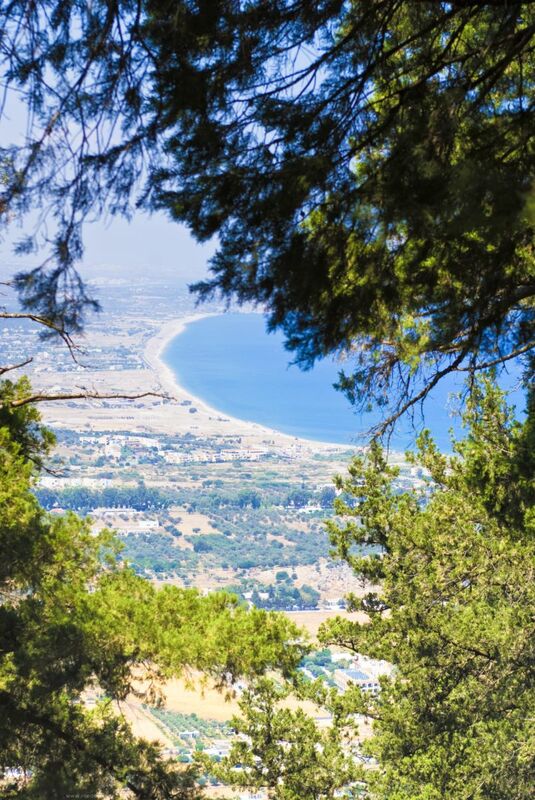 To the right of the coast of Kolymbia, a road leads to the enchanting site of Seven Springs (Epta Piges), a cool oasis with pine and plane-trees and crystal-clear waters. Tsambika is a name designating a sandy beachfront of unique beauty but also a cliff topped by a monk hermitage dedicated to Virgin Mary (Panagia Tsampika Kyra). 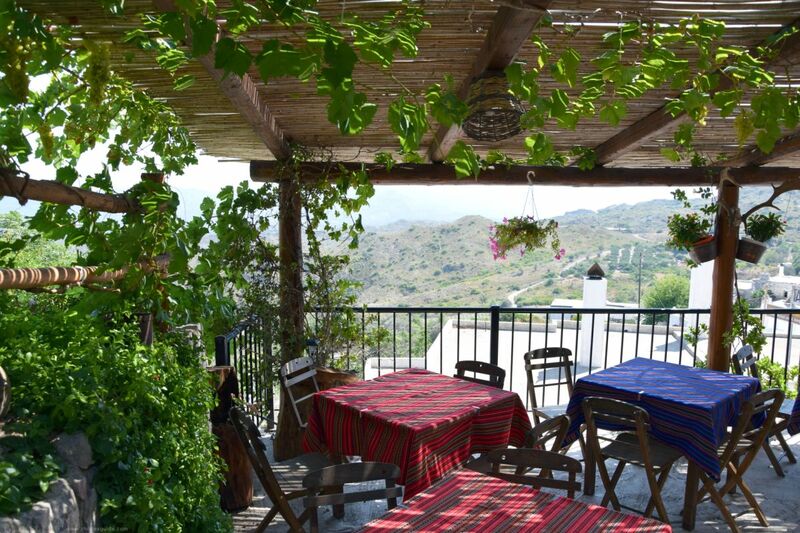 Archangelos (29 km) is definitely worth a visit for its beautiful traditional houses, ceramics and carpet workshops. 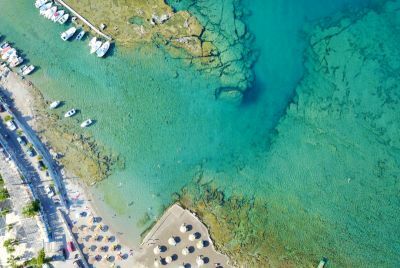 Haraki, a charming fishing village dominated by the medieval fort of Faraklos, is situated on the one end of a marvelous coastline ending up to Vlicha Bay. 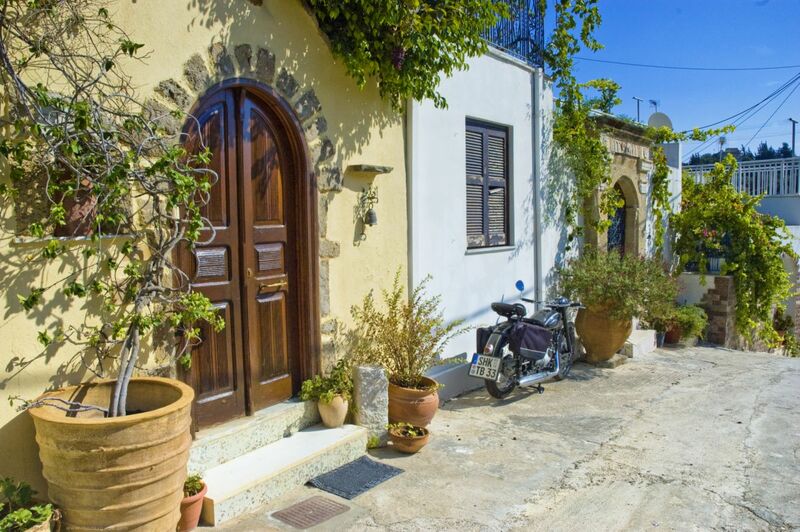 To the south of Lindos, one drives past traditional villages and charming coves in a delightful succession, before the road shifts away from the coastline, turning left towards Katavia (80 km), a major village in southern Rhodes. But the journey is not over yet. It pays to follow the sinuous road leading to the Semi-Island of Prassonissi, a most favored destination for windsurfers from all over the world and site of unique formation: in the summer, a sand corridor connects the island of Rhodes to this rocky islet that otherwise lives isolated from Rhodes, a true gatepost for Rhodes to the south, featuring one of Greece’s most known lighthouses. During the summer months, strong breezes on both sides of the sand-and-dune corridor create the perfect setting for windsurf aficionados and professional athletes who flock here to train and enjoy top-quality fresh fish and sea food between sessions.